I realized my curly hair is always battling the elements from the Southern California desert dryness to the frizz-inducing tropics of Southern Florida. Not only is it difficult to find products without harsh chemicals to define my curls in these varying climates, but I also found I used up these (sometimes expensive) products in less than two weeks – especially if you have thick hair! So I started using and making a ridiculously easy, quick, inexpensive and organic hair gel to help out my curls and my wallet. 1. Simultaneously boil uncovered marshmallow root and flax seeds in separate sauce pans, using water or Aloe Vera juice. 2 cups of water or Aloe Vera Juice for every ¾ cup of Flax Seeds and 1 cup of water or Aloe Vera Juice for ½ cup of Marshmallow root. After 15 minutes set the boiled marshmallow root aside and cover it with a top. 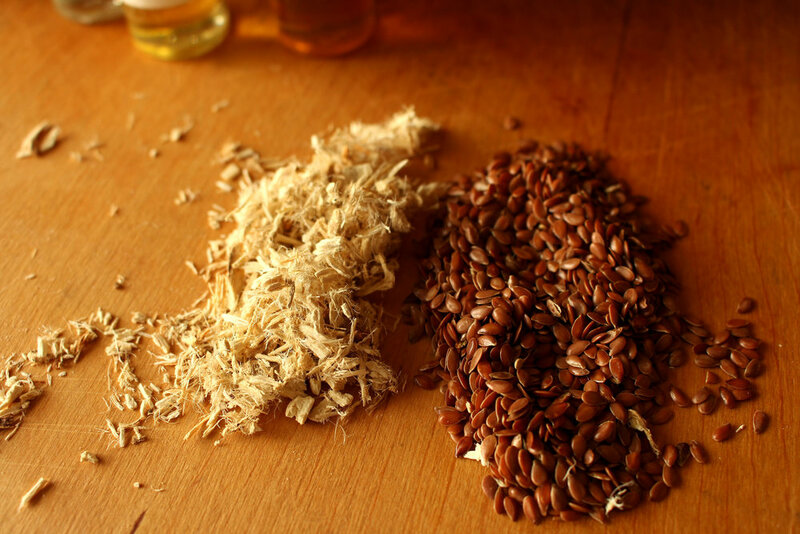 Within 10-15 minutes the boiled flax seeds should be creating a gel-like consistency on the top – check with a spoon periodically for an ideal thick viscosity. 2. Afterwards set aside and strain immediately (otherwise seeds will re-absorb the gel). Strain with a muslin cloth or mesh nylon sock/stocking (easily attainable at the 99 cent store). The best method for straining is to place the nylon sock in a wide mouthed jar and cap the top of the mouth of the jar with the nylon opening. 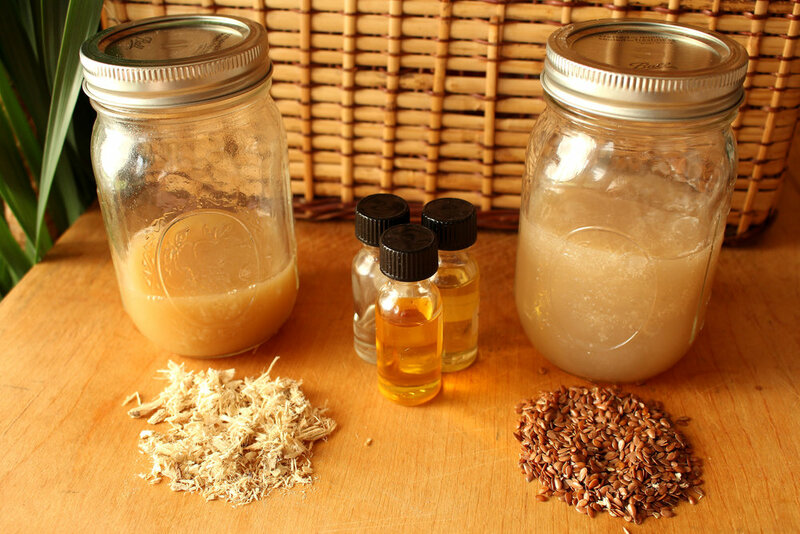 Pour about 1/3 of the boiled flax seeds and gel into the nylon sock within the jar. Strain the gel with tongs or use heat resistant gloves to squeeze gel out through nylon stocking. Repeat the straining process for the left over flax seeds in the pot. 3. Afterwards cut open the nylon stocking and pour the flax seeds back into the saucepan and add 2 more cups of water or aloe vera juice and bring to a boil to do a second extraction. Repeat the straining process. The gel will be much thicker the second time around. In a separate jar, strain marshmallow root with a muslin cloth or nylon stocking. The consistency will be thicker than water but less viscous than the gel. 4. Pour about a quarter to half of the strained marshmallow root into a fresh new jar and fill the remaining space of the jar with the flax seed gel. Add a couple of drops of your favorite Essential oils. My favorites are Ylang Ylang, Lavender, Basil and Rosemary essential oil for a more earthy smell – I add about 5 drops of each for a 6oz jar of gel.